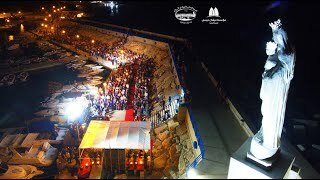 Under the patronage and in the presence of Maronite Patriarch, Cardinal Mar Bechara Boutros Al Rahi, a mass was celebrated by his Beatitude surrounded by Bishops Michel Aoun and Boulos Rouhana and Priests Joseph Ziadeh and Charbel Abi Ezz on August 17, 2018 at the port of Amchit for the inauguration of a Statue of Our Lady of the Seas. The Holy inauguration ceremony organized by Michel Issa Foundation for Local Development and the Fishermen Cooperation in Amchit attracted more than 1500 people coming not only from Amchit City and surroundings but also from all over Lebanon, and it was attended by many key figures and personalities from the region: Dr. Charbel Sleiman representing Former President of Lebanon General Michel Sleiman, General Directorate of Land and Marine Transport Mr. Adel Hafi El Kaissi representing Minister of Public works and transport Youssef Fenianos, Coordinator of “Free Patriotic Movement” party in Jbeil District Mr. Tony Bou Younes representing Minister of Foreign Affairs Gebran Bassil, Coordinator of “Lebanese Forces” party in Jbeil District Mr. Charbel Abi Akl representing Dr. Samir Geagea and Deputy Setrida Geagea, Deputy Ziad Hawat, in addition to the President of Michel Issa Foundation Dr. Toni Issa and President of Fishermen Cooperation Mr. Fares Abi Antoun, and the press. 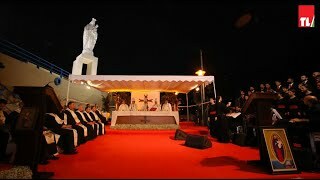 At the beginning of the Mass, Bishop Aoun gave a speech in which he mentioned that this occasion is a cause of joy and pride to Amchit people and that Our Lady of the Seas came to Amchit Port due to the generosity of Michel Issa Foundation for Local Development that offered the Statue with all its expenses in response to the wish of Fishermen Cooperation members. After the Holy Gospel, Patriarch Al Rahi gave a sermon entitled "My soul magnifies the Lord" (Luke 1: 46) in which he linked this Holy occasion to the sermon title by stating “From this inspiration, Michel Issa Foundation for Local Development took the initiative to raise the statue of Our Lady of the Seas on the top of Amchit port, and that Our Lady of the Seas will protect the fishermen, tourists and passers-by so in return these latter will thank and magnify the Lord". Al Kaissi, General Directorate of Land and Marine Transport representing Minister of Public works and transport Youssef Fenianos, mentioned that the rehabilitation of Amchit Port done few years ago was due to the timely support and intensive follow up received back then from President Michel Sleiman in the belief that it is necessary to preserve fishermen who are considered one of the poorest segment of Lebanon. Dr. Toni Issa, President of Michel Issa Foundation for local development also had a speech in which he valued the patronage and the attendance of his Beatitude, and highlighted the real intention of this initiative by declaring: "The intention is not to set up a religious touristic site in the port ... but much simpler, inspired from the simplicity of life, spirituality and humbleness of the fishermen who wanted to illuminate their path by having Our Lady of The Seas on the top of Amchit port. Then, Fishermen Cooperation President, Mr. Fares Abi Antoun gave a speech in which he thanked Patriarch Al Rahi, Minsiter of Public Works and Transport, Michel Issa Foundation and the members of the Fishermen Cooperation. Before the Holy inauguration part, trophies of appreciation where offered by Michel Issa Foundation (headed by Mr. Michel Issa and Dr. Toni Issa), and the Fishermen Cooperation (headed by Mr. Fares Abi Antoun) to the Maronite Patriarch Cardinal Mar Bechara Al Rahi for his Benefaction of the ceremony. Trophies were also handed consecutively to Maronite Bishops Michel Aoun and Boulos Rouhana for their valuable participation in the mass. Finally, Mr. Fares Abi Antoun, Mr. Marwan Issa and Mr. Hassan Rizk (members from the Fishermen Cooperation in Amchit), presented a trophy to Mr. Michel Issa to thank him for his generosity, support and for making their wish come true. At last, the Statue was inaugurated by Patriarch Al Rahi. *This initiative comes in line with MIF's contribution to local development as it motivates local sailors to remain in their hometowns and pursue their fishing profession as their main source of income, while also promoting traditions and culture in the area. Download Press Release. Stay tuned to Michel Issa Foundation Facebook page to know more, and keep scrolling down to check album and All Related Media.